Learn about the IELTS General Training Reading Test. The IELTS GT reading is different to the academic reading in a number of ways but mainly due to the language and difficulty level of the texts. Similar to the academic reading, the general training reading test is 60 minutes in length and has 40 questions. There are three sections in the IELTS GT reading. However, sections one and two might have more than one text. The sections get increasingly difficult. : This section is based on one, two or three texts about English life and could be, for example, an advertisement for a hotel, sports center facilities or educational courses. The texts are not long and are factual rather than descriptive. : This section may also consist of more than one text and often relates to work about pay schemes, work conditions or machinery instructions. : The final section is usually one text which is quite long and it is the hardest. 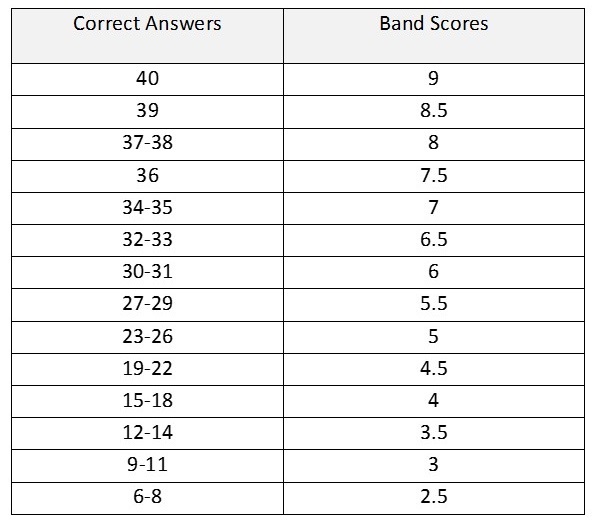 Below is a list of the scores from band 2 to 9 for the GT reading test. The scores are not the same as the academic reading test. Click on the table to enlarge. You can learn Tips on the Different Types of Reading Questions by following the link. You can also practice most of these types of questions on my blog on the IELTS Reading Page and learn more tips. However, most practice exercises are on the level of section 3. Also learn How to Improve your IELTS Reading. For GT IELTS practice reading tests, please visit the BC IELTS page of practice tests. You doing a great job to thousandths across the globe. More power to your elbow. Kindly let me have the ans to the 17th century homework on the reading session. ” A full-timer who takes a year off to have a baby can return to the same employer “. “Upto 12 months unpaid leave for maternity , paternity and adoption related leaves”. I marked the answer as NOT GIVEN as there is no information about the SAME EMPLOYER! But the answer to the question is TRUE and I really can’t understand why is this true as in the entire passage there is no mention about the employer it only states the entitlements of the full-time employees. You are trying to match words instead of meaning. The statement in the question is written in such a way that the employer is obviously the same. If a company offers 12 months unpaid leave, then it is they offering it – not another company. It is not necessary for the company to say “We offer unpaid leave for you to have a baby and return to our company”. The final words are not necessary. I hope you now see that you need to use logical, common sense and also not match words. Sure. I’ll keep that in mind. Thank you, Liz, for helping me to improve my English skills for IELTS. Even when I feel discomfort about the difficult sections of the lectures, I smile when you smile. You really deserve Noble Peace Prize. Today I have done reading test practice from Cambridge General Reading Test B. In that test, I have faced one issue in section 1 questions 8-14. In the summary, they are written, NO MORE THAN THREE WORDS. But, the eighth question’s answer is a NUMBER. I have right the same answer as it answers is 25 per cent. But my confusion is that, is the answer is correct as per the given summary.? I don’t know which test that is. If you send me a link or tell me how to view it, I’ll take a look. During my recent IELTS testing, there were 4 sections for reading as against 3 sections. Did you read the page above? There are three sections. However, section one might contain more than one passage. This means in one sections there is a passage with questions and then a second passage with questions – all in one section. Your lessons are really helpful and amazing. I wanted to ask that in reading section during answering a question if i write the answer as : duplex printers and when i check it from the answer key it was (duplex) printers so is my answer right or wrong ? Also the word limit was 2 words so i didnt cross that. Westley taxi services will go to any destination. The answers are both true but i dont understand why? could you help me pls? For your statement in the video “By the second half of 17th century, coffee had found its way to Europe” Question : Coffee arrived in Europe after the 17th century. ​Hi Liz, You advised in one of your videos for Reading that we should first read the passage very quickly in order to understand the text but we should only spend 2-3 minutes time doing this and then we should come towards the questions and start locating the information that question asks for. My question is that, is your above advise true only true for Section 3 or all the Sections in GT Module ? Section 3 only has 1 text in GT module which is longer and comprises mostly 12 questions while Section 1 and Section 2 typically have 2-3 text which are shorter in length. I love your classes and it helps me alot to prepare for ielts.Plz help me with a TFNG ,where i frequently loses my marks. passage:”The company pays my bills and makes me laugh”. statement:The reviewer of the company says that working there is both fun and earns enough money. “pays my bills” means to have enough money. You need to look at meaning not words. It is an expression in English “I earn enough to pay the bills” = I earn enough money. I am preparing for IELTS GT and have downloaded Cambridge books(1-12 GT). I have gone through the academic reading tests available in the books as well. I was under the impression that I can use academic reading for GT reading practise. As the number of academic tests in the Cambridge is high when compared to the GT doing so would mean more stuff to work with. However now I am concerned that the efforts might have been in vain as academic and GT reading appear to be different. I wanted to know if it makes sense to continue using academic reading stuff in addition to GT reading stuff? Or would it be a waste of time? Also the Cambridge series has only two GT papers per book. Will it be sufficient to go through just those? Thank you very much for the details of the scoring system. I am aiming for the IELTS general training module in some time. Here is one thing not going off my mind, the reading part has 40 questions and each question holds one mark as far as I can read on sample test paper from British Council or Cambridge English. If I score 35 in the listening module, I get 8. If I get 36 questions right in the reading module my score is still 7.5. Why do I have to get 2 more question right in reading part compared to listening when it says each question holds one mark. The band scores for GT listening and reading are not the same. The threshold for each band score is different. In Cambridge book no. 9 , in general training/ reading test. One of the questions (( no more than three words)) it’s answer (( August 31st)) is this correct?. What about “31” it’s no. how can they wrote it ? . Of course it is correct. “No more than three words and/or a number” = August 31st. Check the original source again. You will need to the buy the IELTS Cambridge test books which are real test materials. Make sure you check that the tests are GT tests. Hi Liz, I have subscribed. Thank you very much for lessons. It is very helpful. I always score low in Reading and I don’t know why. I have a question in reading component. For answers, should words be exactly as in the passage or we can alter grammar to fit in the question and instructions? E.g. In passage “in the tomb of pharaoh” is the answer. However, instructions say “no more than 3 words” so to fit in this, can I write answer as “the pharaoh’s tomb”?? The words must not be altered. However, when you write dates, it is difference. We usually say “the sixteenth of July”, but we write “16 July” or “16th July” – we miss the “of”. Thank You veryyyyyyy much lizzzz….. I was so nervous but i feel cool now. I love u ……….. Liz …. Hi Liz.. Is there any reading exercises for general training? All the reading samplers looks like academic version. I’m taking up the exam on may 13th.. Kindly help with general training samples. My reading materials are written by myself so they are not academic or GT. They are practice lessons for learn skills. The question types are the same in GT and Academic reading so you can still benefit from some of the easier lessons. It’s best you get the IELTS Cambridge test books and use them for your GT practice. Hello from Albania. I am fascinated from this website, I find it very helpful. It is very clear and concise information. Thank u Liz. Is it possible to take a highlighter pen to the exam hall ? I will be using it to highlight the keywords. If I highlight using a pencil, it is not that clear to me. Do I need to ask for permission in advance ? I purchased your video lessons on writing task 2. Would like to thank you for them as well ! I am not good in reading section. I need to score 6 or 6.5 in reading but I got every time 5.5 bands in sample test.Can you suggest me to improve my reading band. Hi Liz, Thanks for all useful tips and material. You said TFNG type come in order of paragraph, but how about below types. Thank you for your great help you provide. I just have one question for you. I believe that the current exams seem to be more difficult than Cambridge exams series 1-10! (specially the GT reading module). If so, what preparation materials precisely simulate the same hardness should I use? The levels should be the same but topics change. Try book 11 which is the most recent set of tests available. Thanks for explaining the True, false and NG questions, that’s very clear and useful. However, I cannot open the link of BC Ielts page. Could you please help me check that link? Thanks for letting me know 🙂 I’ve updated the link – check to see if it works for you. The answers come in order for TFNG. Each question that is answered correctly is one point. This means the multiple choice depends on whether it is for one question or three questions. do we get same passages for both academic and general reading in the exam ? i have done almost all the academic reading passages from Cambridge 1 to 11 series. so shall i start practicing general reading passages till my exam? You can get other practice test books for academic reading. The GT reading passages are not the right content and are too easy for academic students. First of all many thanks and appreciate for your great help through your lectures. They are other optional answers which can be considered correct. Hello Liz, Can I write all capitals for reading as well? You told a tip of writing all capitals for listening. I’m very happy to contact with you.. I recently appeared for IELTS GT and score above band 7 in all the section except reading (6.5). I wanted your valuable comments on the following queries. I usually complete first 2 sections in 15 mins each hence I get 30 mins for section 3. But plausibly because of anxiety, stress, ticking timer I got nervous and hence inspite of having good time in my hand I couldn’t satisfactorily answer Section 3 hence the lower band :(. Is it advisable to pick up section 3 first and other sections later on. or just go with the sequence? Q2. The passage in section 2 had asked to answer the questions in NO MORE THAN THREE WORDS and questions were in Question format. So my query is , for example the Q is Where would you find the details of dress code policy? I’m confused because the question is in a form of Question and not in sentence completion type, so should we include THE or not? http://ieltsliz.com/liz-notice-2015-2016/ See my useful website page for practice tests. Although you are on holiday, you are responding to your student’s queries. Thanks for the same :). Liz, you have answered my query 3 and I did check the site shared in your response. But, could you please also provide some guidance on Q1 and Q2? There are no half marks in IELTS. Your answer is either 100% correct or it is wrong. Your website is very informative. I really learn alot from it. Can you help me in this regards???. Can you help me in this regards??? Get the IELTS Cambridge test books from 1 to 10. They are the real exam papers. There are other practice test books which you can purchase. Look in your local shop or online. Ashan..I read your blog on reading all books , can you help me get the Xerox of all pls ? It is fine to use letters. Sure, you can replace the word with the letter. Hi Liz, i have an exam next month (Nov 7) and I want to study hard this month to have a score 6.5 , my level in English not very good . Please , What should I do this month to have this score ? See my information pages for tips about improving your score and start working on producing more accurate language. How i can contact you plz. You contact me through this blog. I did IELTS test , but i could not achieve the target Band .cloud you help me to improve my english reading and writing task skills. Can you send me example of General reading tests??? I’m getting panic for my ielts exam Can u please help me for it.. Relax. Spend time making a list of things you want to check and practice before your test for each section. Then work through your list with method and control. Don’t panic – just be systematic and logical. The homework for the TFNG questions is found on this page: http://ieltsliz.com/ielts-true-false-not-given-essential-tips/ under the video. I got my awnser right…..its false I m very happy thanx thanx mam…….i need more help from u pls help me and give me tips for writing and give more videos for writing.,…..thnx u again its really helpful. After being immersed into IELT´s for few weeks, one of the main problem is that there are too much material and way too many people “In the Pool”. I just realised to whom I should follow and that´s Liz, Hands down! Amazing work ! Hi Liz. You have amazing content but I’m quite confused navigating your website. I noticed that after clicking, say, one link about Writing Task 1, I am redirected to a page that does not appear on the main menu and a there is a whole new set of links found in that page which are not also found on any menu. What I mean is, I’m having a hard time knowing under what category does a page fall into. Or maybe it’s just me. Could you please recommed a way how to follow through a topic from start to end? Thank you very much. It means that the page has been deleted. Can you let me know which link didn’t work so I can fix it? Thanks Liz for this explanation. it is very clear for true/false and NG questions. I had came to know from your True/False/Not Given Section that the Answers Comes in Order. Is this will be always be in order. I had seen some practise questions sheets which is not in order.Can you please make it clear. Where did you see answers not in order? Was it in the Cambridge IELTS test books from 10 to 10? Plz sent me a link for english pronunciation..
Hello Liz this is clear explanation.can u send me a general reading…..
All GT reading tests can be found on official IELTS sites like the BC. See the writing task 2 page, for linking words. I am writing to you regarding the unexpected incident which took place during my journey from London to Kathmandu last week. Six days ago, on December 18, 2017, I traveled by your company’s Airbus A1 Qatar Airways flight No.B77 from London to Tribhuwan International airport Kathmandu, Nepal. During this trip, unfortunately, my luggage was lost which contains very important documents including my passport and academic transcript. The suitcase has black color and rectangular 4/6 size. I had informed immediately about this issue when I got to Kathmandu airport, however, I have not received any information from the authority so far which is embarrassing. I have been desperately waiting to be informed from your side, so, I would like to know what your company is doing regarding this issue. I would like you to inform me as soon as possible.